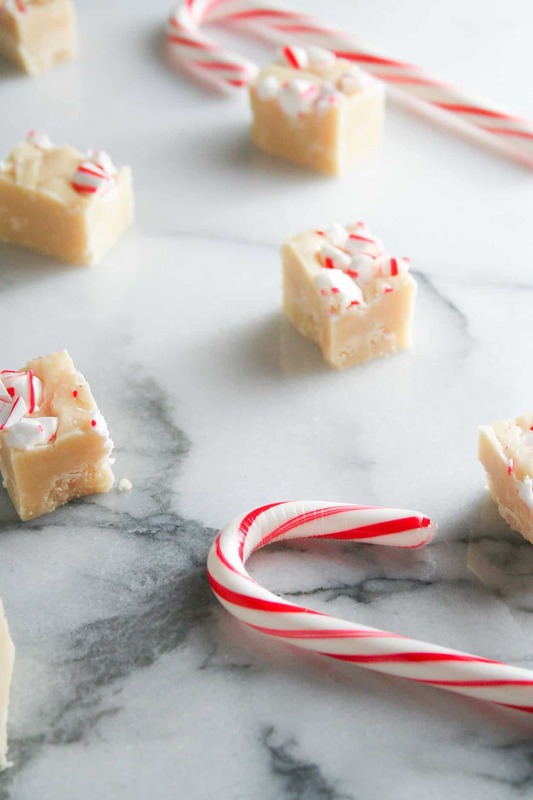 A simple and festive twist on a classic recipe – White Chocolate Peppermint Fudge is an easy to make holiday treat with no candy thermometer required! As I’m writing this, I am sitting at my new kitchen table with my Christmas tree all lit up, candles glowing, snowing falling, and feeling like all is right. It was a slow morning – I made cranberry banana bread and had big cup of coffee. Pat and I met his parents at Little Goat for lunch. And now we are settled in for the day, enjoying the snow falling and wrapping Christmas presents. 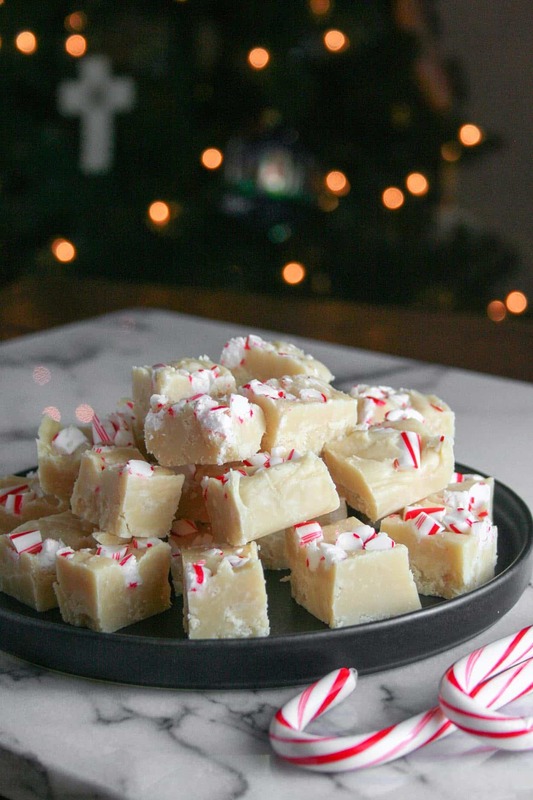 I made this white chocolate peppermint fudge a few weeks ago for a Christmas cookie exchange with some girlfriends and it was such a hit. There were so many different types of cookies; my favorite, for obvious reasons, was a chocolate chip cookie with candied bacon bits. You can see why it was my favorite. The fudge I brought is super simple to make (don’t turn on your oven) AND you can put your candy thermometer away because you won’t be needing that either! Plus, you only need a few ingredients – sugar, evaporated milk, butter, salt, marshmallows (I used these vegan marshmallows! ), white chocolate chips, peppermint extract, and candy canes. 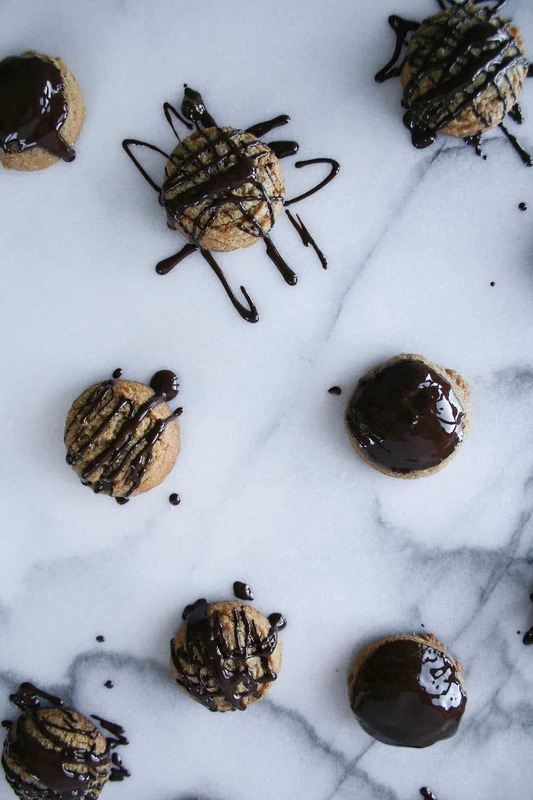 These little squares of holiday goodness are super sweet and definitely don’t fall into the category of “wholesome eats”; but it’s the holidays, so let’s all live a little – ok? 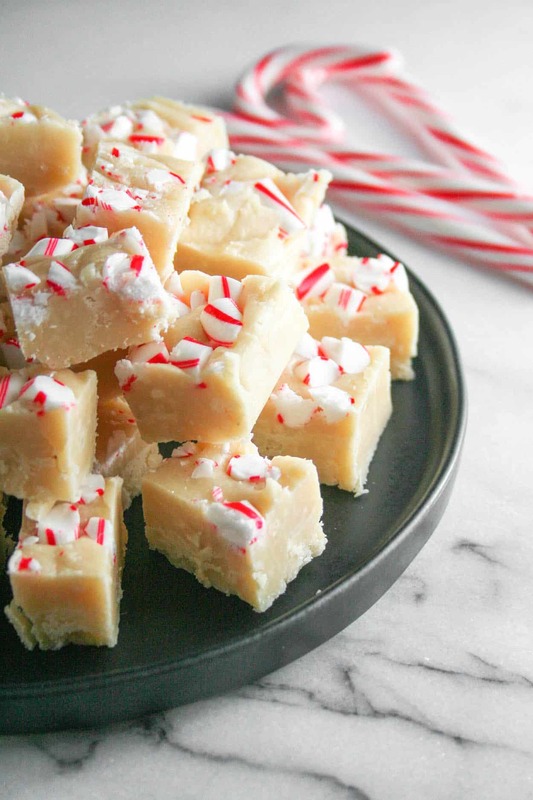 You will love this White Chocolate Peppermint Fudge! If you make this or any of my other recipes, post a picture on social media and use the hashtag #imhungrybynature for a chance to be featured! Line an 8-inch-square baking pan with foil. Combine sugar, evaporated milk, butter and salt in medium saucepan. Bring to a full rolling boil over medium heat, stirring constantly. Boil, stirring constantly, for 4 to 5 minutes. Remove from heat. 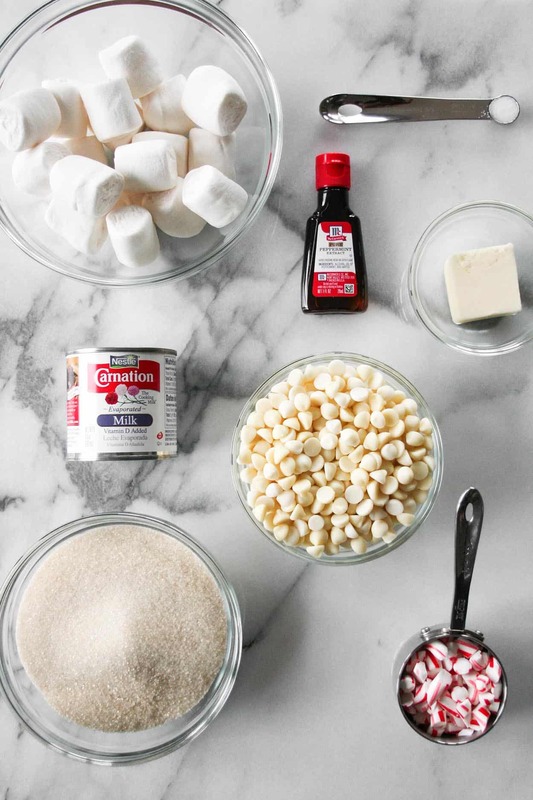 Stir in marshmallows, white chocolate chips, and peppermint extract. Stir vigorously for 1 minute or until marshmallows are melted. If you are having trouble getting the marshmallows to melt, turn heat to low and continue stirring until melted. Pour into prepared baking pan; top with candy cane pieces and press them into the fudge. Refrigerate for 2 hours or until firm. Lift from pan; remove foil. Cut into 48 pieces. *You can sub in 2 cups of mini marshmallows. Mini marshmallows will make the melting process easier. 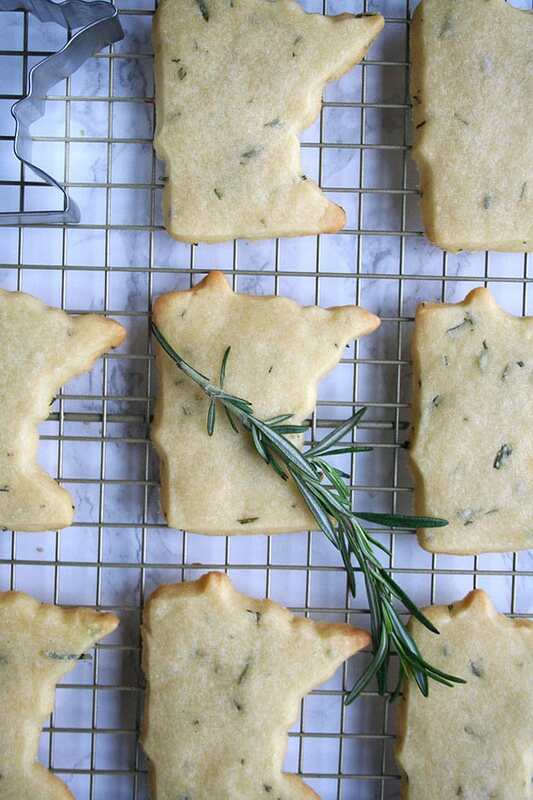 Looking for other holiday cookies? Here are a few of my favorites! Ah everything about this post is getting me in the holiday spirit! Fudge! Peppermint! The tree and sparkly lights in the background! SWOON! I’m so happy to hear that – thanks Christine!